In churches, we learn new songs from time to time – which is a good thing. This is normally done by the music leader singing the song, and then everyone trying to join in. Those who read music would perhaps like to have music, but it’s almost always not available, because it couldn’t be projected (as those who can’t read music would be lost and projectors are low resolution) and photocopying it and handing it out is inconvenient and disruptive. But what if one could take the bare essentials of sheet music and display them alongside the words? What’s most important to people when learning a new tune? I would say two things – note duration, and the pitch difference between the previous note and the current one. Hence, Tunelines, which are inspired by Sparklines, a very simple way of showing a graph of data, usually over time. 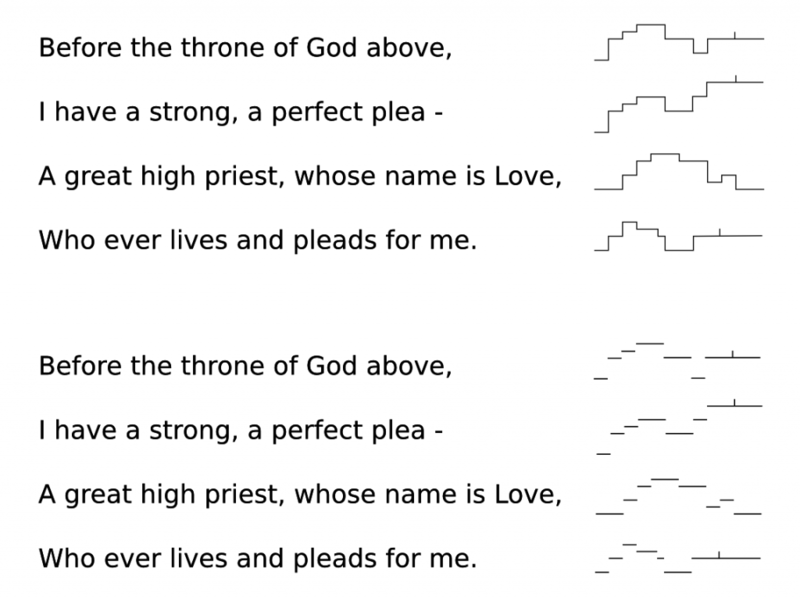 The idea is that they can be displayed alongside the lyrics while a congregation is learning a song, and removed after a few times once everyone has the hang of it. There are two variants, one with verticals and one without. I prefer with, as I think it’s easier to follow, but reasonable people may differ. Right-click and “View Image” for a larger version. My example is Before The Throne of God Above. For various reasons my church has no plans to use these, so I’m shelving this project, but just wanted to put it out there in case it inspires anyone else. This entry was posted in Personal, Usability by gerv. Bookmark the permalink.